The only thing I consider optional is the fertilizer, but you will be much happier with your plants if you give them fertilizer. They will be much larger and healthier, and the longer you keep them indoors, the more important the fertilizer becomes. I would like to spend a little time talking about the Seed Starting Mix. 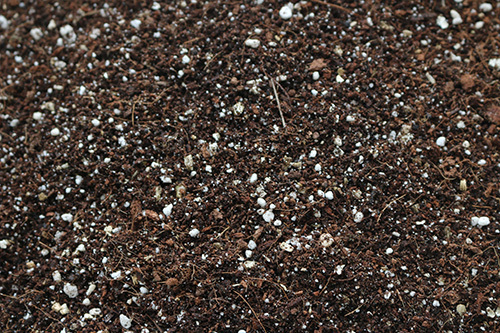 Most seed starting mixes are peat moss based. I really don't like peat moss. It repels water, so it is difficult to get it wet in the beginning, and then you absolutely need to keep it wet until you transplant your seedlings. If it dries out, it will be difficult to get it wet again. If the soil dries out and you water from above, then the water will run around the outside of the soil, running out of the pot and never getting water to the roots of the seedling. I have seen many times where the seedling looks like it isn't getting water, even though you are watering it. The peat just doesn't transfer water well. And I absolutely have had no luck with peat pellets. Those are the little compressed pots that grow when you soak them. They usually have a net around the outside. I have pulled out plants at the end of the season that look tiny and sickly, only to find them completely root bound in the net. I much prefer coconut coir for the base of my seed mix. Coconut coir loves water, and absorbs it quickly and easily. It is so much easier to keep your seedlings watered when you use coconut coir. I like to mix it with perlite and vermiculite to lighten the soil. I also add some worm castings to the mix. Worm castings are excellent fertilizer, giving your seedlings much needed nutrients to help them grow and thrive. I usually mix it by eye for the perlite and vermiculite and add about half as much worm castings as perlite. Planting the seeds is really easy. Just fill your pots with soil. Don't pack the soil in. You want your plants to have an easy time sending out roots. I like to label each pot so that I know what I'm planting. Plant your seeds. The basic rule of thumb is to plant the seed as deep as 1-2 times the size of the seed. When you think about it, that isn't deep at all for most seeds. Many just are lightly scattered on the surface. I usually tap the surface lightly or brush my finger lightly across the surface to 'bury' the sees. They basically fall down below a little dirt. Melons and squash go a little lower, but still only 1/4 inch or so. 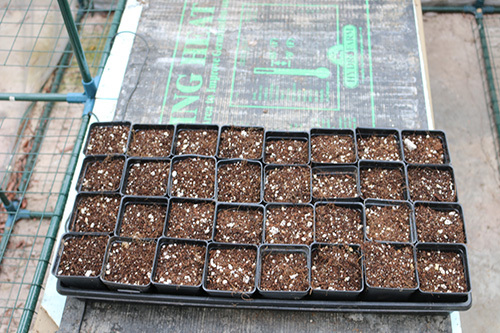 Once the seeds are planted it is time to put the pots in a tray. 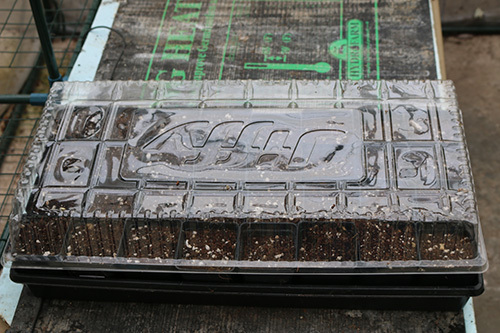 I plant my seedlings in either the 72 little cell trays that come with the Jiffy Easy Grow Greenhouse or in 32 2 1/2 inch black plastic pots. I plant corn and flowers and celery in the little cells, or tomatoes, peppers, eggplant, melons, cucumbers and squash in the 2 1/2 inch pots. I put those pots in the Jiffy Easy Grow Greenhouse. The greenhouse needs to go on a heat mat in a brightly lit location. Either a bright window sill or under a grow light or in a greenhouse. Make sure that the location isn't too cold. The heat mat can't keep the pots warm in a really cold location. I keep mine in a greenhouse that I heat to 55-60 degrees. 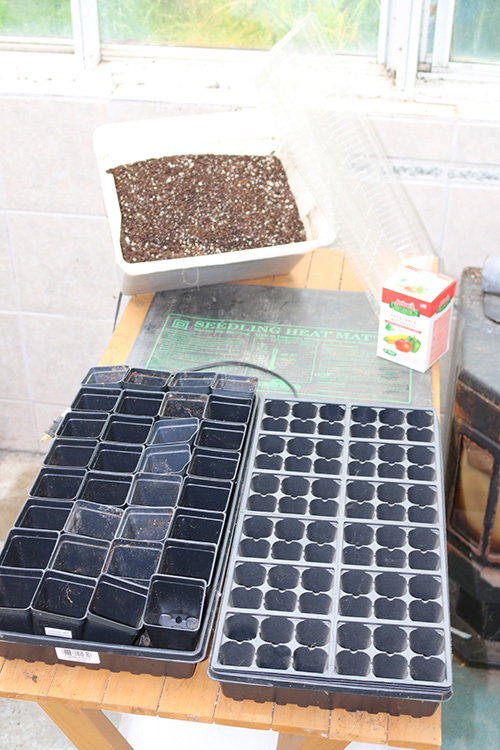 The heat mat will keep the seedlings at around 80 degrees. Perfect for germination for almost all seeds. Now it is time to water your seedlings. 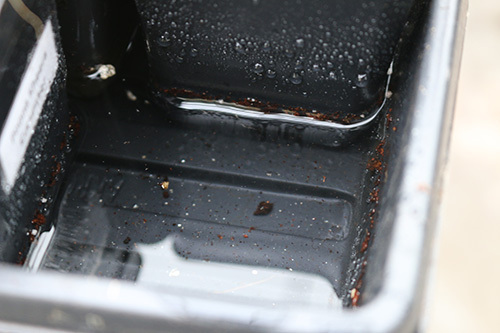 I like to keep around 1/2 to 1 inch of water in the bottom of the Jiffy Easy Grow Greenhouse tray. The pots are sitting in standing water, and this is a good thing. The soil will wick up the water and keep the seedlings nice and wet. After they germinate, I continue to keep them that wet. The only time I've had a problem with mold is when the seedlings don't germinate and they sit in water for over 2 months without anything growing. After they are watered, I cover the top with the clear plastic dome lid and leave them to sprout. With a heat mat most seeds sprout in 3-7 days, but some vegetables take 2-4 weeks. I usually fertilize once a week. For that watering, I mix up a water soluble fertilizer and fill the tray with that mixture instead of plain water.